Contrary to what you might think, the following question isn’t a delayed april fools joke but instead my very own sunday morning i’ll-need-to-find-a-solution- to-that-car-problem- issue-in-Nairobi brainstorming attempt to figure out how I’ll get decent transport for myself in terms of having the convenience of driving my own car. My own car? My car is a 1989 VW Golf II I’ve mentioned earlier here and here, and I tell you: BEFORE I sell this beloved gari to any strange Belarussian car dealer for something like EUR 100,- who then sells it to a fat man sitting on his car empire within a free port somewhere in Ghana, West Africa I am way much better off taking my car to Kenya and driving it there till it falls (even more) apart. Having said that, what about the route? Would it be possible to drive a car from here to Nairobi? I know it has been done before, so why shouldn’t I do the same? Not necessarily with my current car, maybe an older Mercedes with A/C etc that sells for something like EUR 500,- ….Mzeecedric, any idea? Ati, I know you’re laughing on this, but hey, it’s an adventurous idea, ama? drive over egypt and sudan is better take enough gold or cash with you. you need to bribe some police officer. It is almost better take a coast road if is possible. 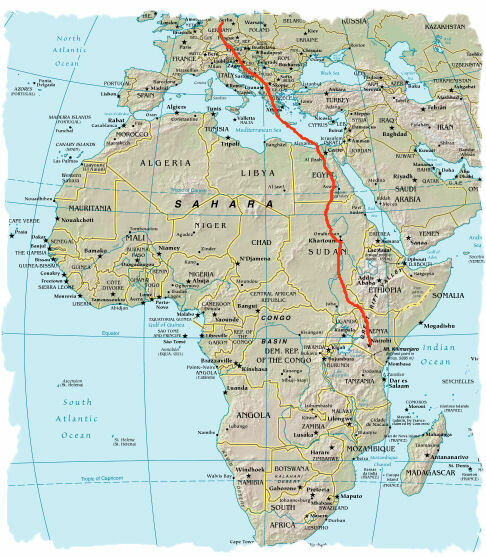 But th way to kenya is not so dangerous like the way to namibia by car. my first thinking to drive to the cape was take the west route, but your way is more safety than the west route. what you really need is a landrover with a second fuel tank under the seat. calculate the fuel you need for the travel. if i have time i will come with you on this trip, it is a great adventure. yeah, the idea is great. is there a free seat? I just remember a funny kikamba song “To germany by foot”, so if people go footing, there shouldn’t be any problem to use a mercedes or even the golf! Ngilasya nilyiu ngethia ndiota na mwende ngethe yi muingo Germany kweli ngew’a kuia. Wiku miuingo ngumisia muno we mwende no mbaka ngwone ngoo yakwa itulie. Syindu syakwa syi Germany kindu kyakwaa ki Germany niendete by foot nyie! Eeehhh, from GermanYYY to KenYa via road, that’s the point. And not via LandRover, dear KP – although that sure is the way it’s supposed to be done – but with an ordinary 2WD car like my Golf or any other cheaper limousine which is still good enough but sells for small amounts due to high taxes (these older cars like Saab 9000 or BMWs from the early 1990s aren’t that expensive – it’s just that no one buys them due to these high environmental-related taxes). @Mwende: LOL, YOU commented @ the same time :-) Wewe, I was going to ask you as well! Ah ge, jetzt kommt bestimmt noch der CG mit nem VW Bully (+ ner AfricaTwin im Gepäck) dazu und auffa gehts, fahrm ma auf Safari, ge? Btw. booked a flight to portugal with some friends today, yeah! hakuna pesa –> that’s it even my problem: ndina mbesa! Wow! I am so surprised to find that you are white! Well anyway, I wanted to say make sure you have visa’s for all the countries you would drive through! I would not recommend it – I would only attempt such a journey in a brand new car. Also, cars older than 1999 are not supposed to be imported to Kenya anymore, but I don’t think anyone is checking at the Turkana border point. Thx Bankelele – that’s good information. I remember you blogged about this new import policy the other day, ama? Well maybe there’s a way to take the car there and sell it to a neighbouring country that doesn’t have such rules. Also, the initial plan was to have my own transport in Nbo. Maybe there’s another workaround on this. @Mbuzi: I can’t hear you on this! Uko wapi? I laughed my head off when I saw this. Very reckless and lots of fun. The kind of thing my wife would never ever let me do. Question for you, what do you plan to do over the Mediterranean Sea? If you are serious about importing a car, I have a much better idea for you. Drop me an email at steve at ntwiga period net and can tell you a little more about it. I can tell you, I grew up in Sudan and it’s not picnic even with a reliable 4WD… Your best luck would be on a piki. Hashibwana, sure sure, I know YOU would love to do this as well, right? I hate it, man, i hate it…we NEED to get some PAID time off and do some things that might be considered a waste of time by others like taking 6 months off for a safari on the continent. shh, i’ll never -> congrats! and my seat is still booked! am just enjoying a cup of milo because ketepa has run out of stock. i hate to be here! if you do it, all the best! A couple of friends and I are thinking about going the other way. Well another way. Across Africa on the line of the Equator. Starting in the West and ending up on the Kenyan coast. A photo journal journey. It may make a good dry run for your much more ambitious project! But do I say??! It IS possiboooooool.